Have your clients join us in paradise at Hyatt Ziva Cancun for savings that everyone will love. Book now through September 19, 2018 and save up to 55% + $200 in resort coupons. Hyatt Ziva Cancun is the only resort in the region surrounded on three sides by the sparkling Caribbean Sea, this family-friendly oasis features private balconies with stunning views in all accommodations. 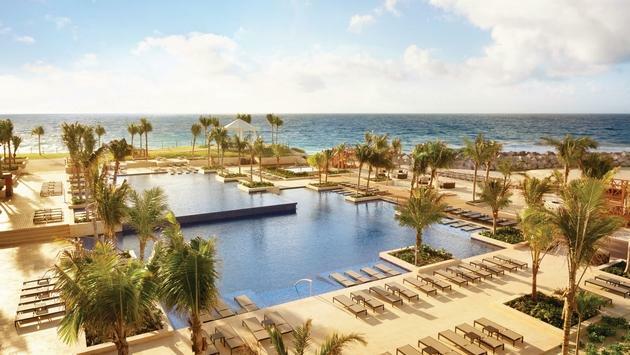 Offer valid for a discount of up to 55% off the Hyatt standard rate and one booklet of resort coupons for bookings made now through May 7, 2019 for stays through December 20, 2020 at Hyatt Ziva Cancun. A limited number of rooms are allocated to this offer; reservations subject to availability. Resort coupons per room, per stay, valid now through December 20, 2020. Coupons not available December 21, 2019 –January 1, 2020.Promotional blackout periods may apply due to seasonal periods or special events, and normal arrival/departure restrictions apply. Resort credit coupons can be used toward the following services within the hotel: Private Beach Cabana, Spa Treatments, Romantic Dinner, Premium Wine or Liquor, Jewelry Store, Photo Shop and Room Upgrade. A total of $200 in resort coupons are available to be used in the following services:$20 –Private Beach Cabana$20 –Spa Treatments$20 –RomanticDinner$10 –Premium Bottle of Wine / Liquor (2 coupons)$20 –Photo Services$50 –Jewelry Store$50 –Room UpgradeCoupons are not combinable with any other promotions; resort coupons do not hold any cash value, are non-refundable and non-transferable. Coupons are valid if paying with credit card only, no cash, and must be redeemed at the time of reservation or service, since no deductions will be taken at time of check out. Photo Sessions: Coupon valid only in photo sessions above $220 USD. Subject to change without previous notification.Offer not valid with groups, conventions, other promotional offers, tour packages or special rate programs. Offer excludes, unless specifically noted, gratuity, service charges, mandatory resort fees, applicable taxes and other incidental expenses. Additional charges may apply for additional guests or room type upgrades. Other restrictions may apply. Offer not valid in conjunction with previously booked or held stays and may not be combined with other offers. Not redeemable for cash or other substitutions. Any unauthorized transfer, sale, distribution or reproduction constitutes fraud. Hyatt reserves the right to alter or withdraw this offer at any time without notice. Not responsible for errors or omissions.